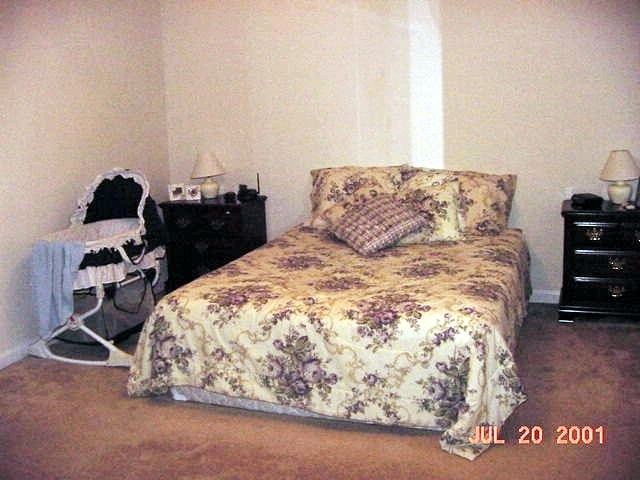 This is the year we bought our house and this is what our master bedroom looked like. At this time we had a 2 month old baby and so putting our bed on the frame was most likely last thing on our list of to-do’s. At least the frame was out-of-the-way, tucked off in the corner. This picture was taken a few years later. We did manage to get the mattress and box springs off the floor and onto their frame. The bassinet is gone, which tells me the baby is sleeping in his own room; much to our relief, I’m sure. 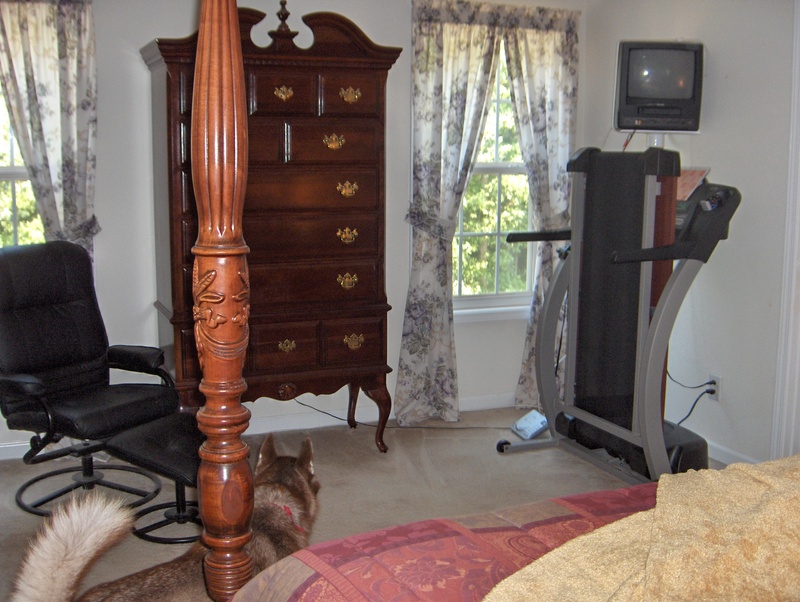 We did add curtains, a treadmill and the black chair. We still haven’t added any paint at this point. Our room stayed like this until 2009. We had just gotten back from the beach and I was completely inspired to finally paint our bedroom. Hubby always takes two weeks off in July. One of those weeks we spend at the beach the other we spend at home trying to do some type of home improvement project. This year, it was going to be our bedroom. So off to Home Depot to pick out some paint colors. Since we had been at the beach, I was all into a beach theme. 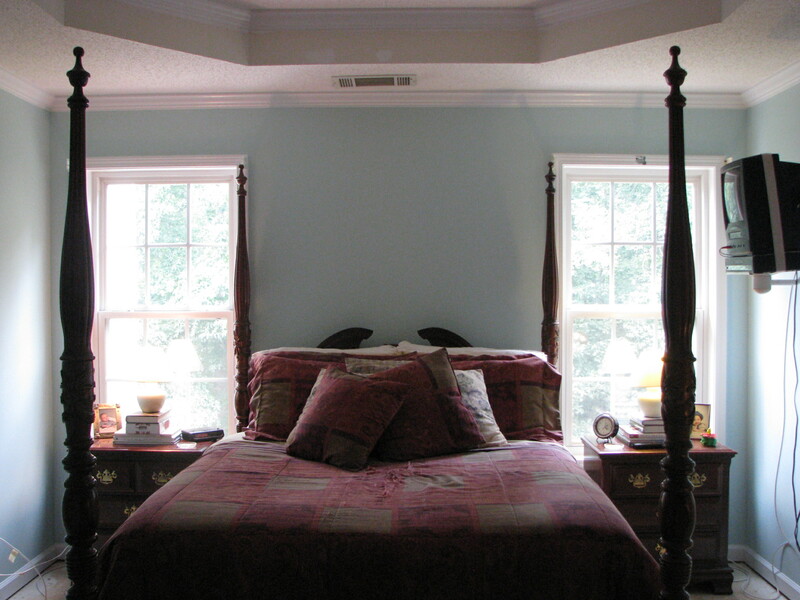 I wanted pale blue walls and some beachy touches. Can you see that little patch of blue? That’s what we ended up going with. As we got started moving furniture and wiping down walls, we noticed how gross and disgusting our carpet was. 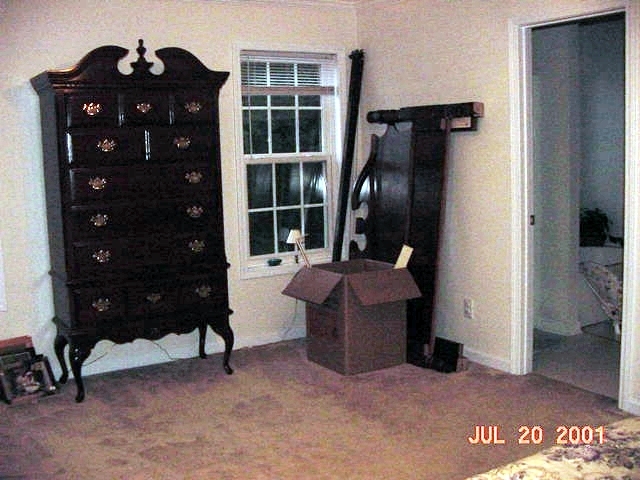 It was especially bad under the bed. We have a Siberian Husky and she would lay under the bed and it was so gross under there. Note: We hate carpet for this very reason. So then we had the bright idea to go ahead and pull up the carpet. Our plan was to rearrange the bedroom furniture and the bed wouldn’t be over the dirt spot the dog left anymore. Pulling up the carpet seemed like the logical choice. We would just go out and get the hardwoods that we want up there anyway. So, that’s what we did. We pulled up the carpet. And we threw it out the window. The padding underneath it was equally disgusting and the floor under the padding had this very fine sand type stuff all over it. That would be our dirt that we live in. I don’t care what kind of vacuum you have, you will never get that gritty sandy pieces of dirt out of your carpets. Don’t fool yourselves into thinking you are. We have a Rainbow vacuum cleaner and still had the fine dirt under our carpets. So that all came up and got thrown away and we got to painting the baseboards to make them nice and shiny and new looking. 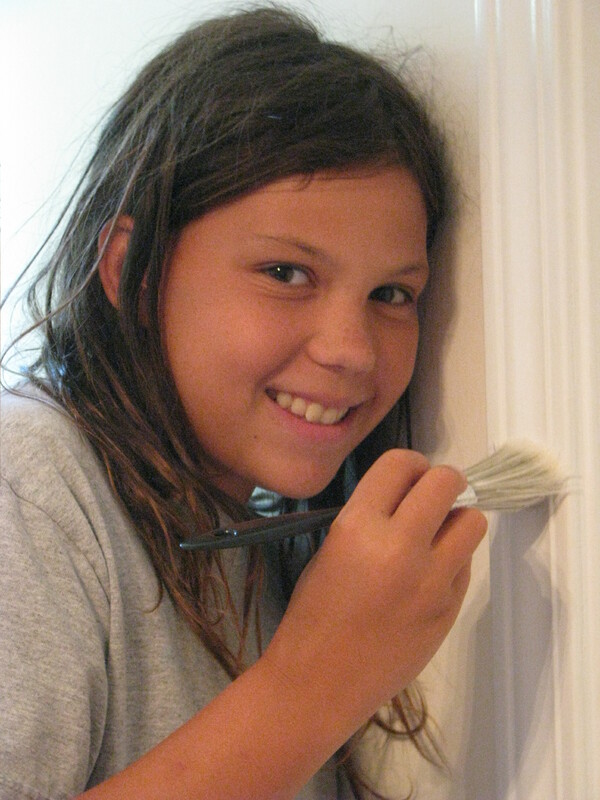 Actually, the kids love to help paint so we put them to work. 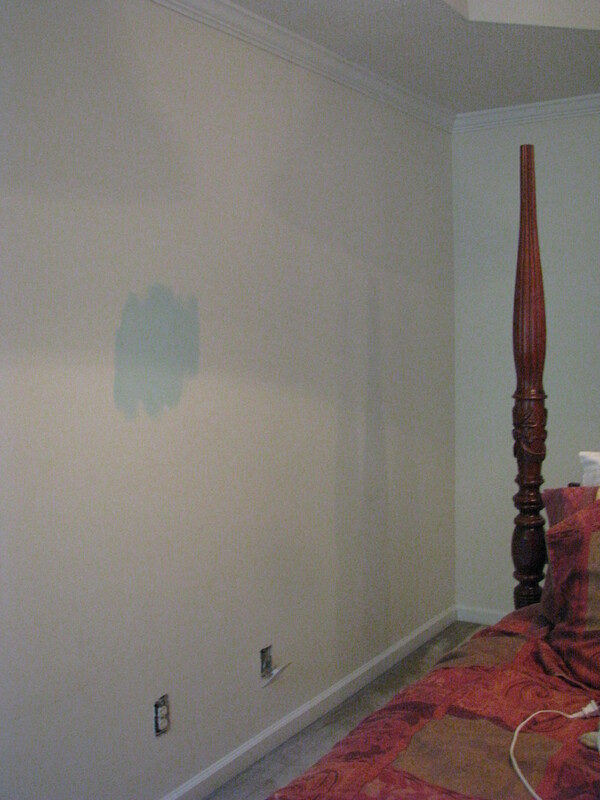 This is how the room looked after we finished painting. 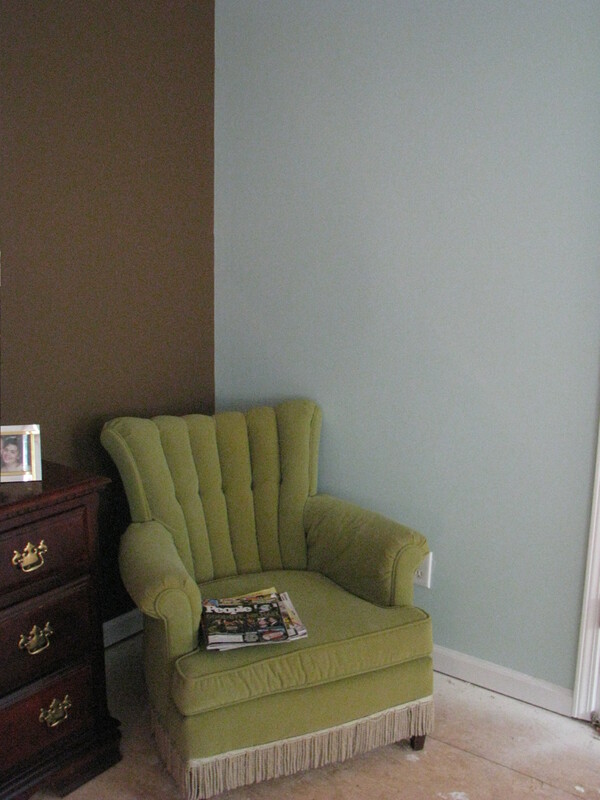 Hubby suggested we add an accent wall and I couldn’t agree more. I love how it turned out. 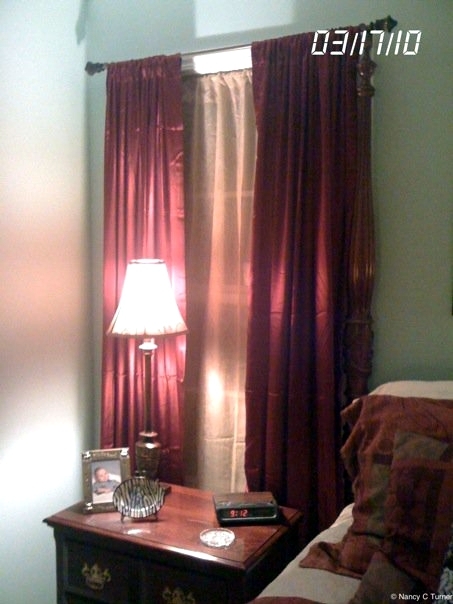 Since then we have changed the bedding, gotten new curtains and lamps and added some more pillows. 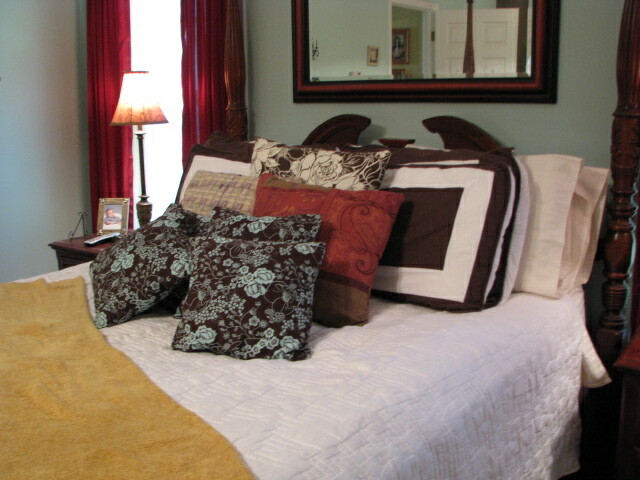 I didn’t like the maroon pillows so I changed them. 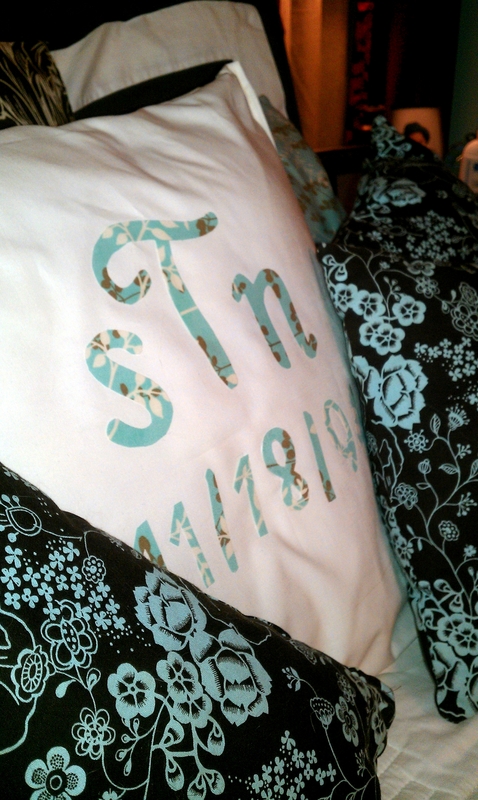 You can read about the new pillows I made here. I’ve also added a few accessories. So that brings us to today. The room is pretty much finished save for one very important thing. The floors. 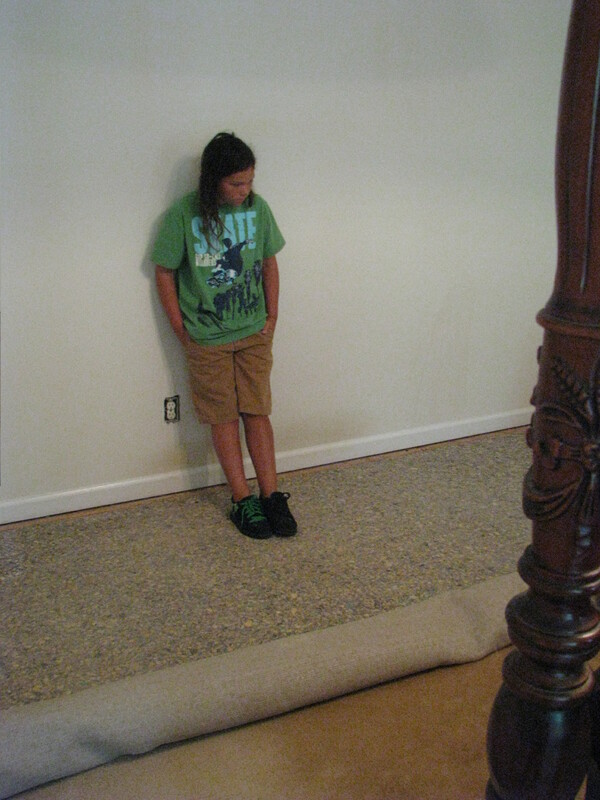 I know we probably shouldn’t have pulled up our carpet until we had new floors to put down but we didn’t. We went ahead and pulled those nasty things on up. I know some people wouldn’t put up with living on plywood floors for very long, but that’s just how we do it over here. It really didn’t bother me too much. I was just glad to have the nasty carpet out of the house. We are finally ready to put down hardwoods in the master bedroom. I couldn’t be more excited. 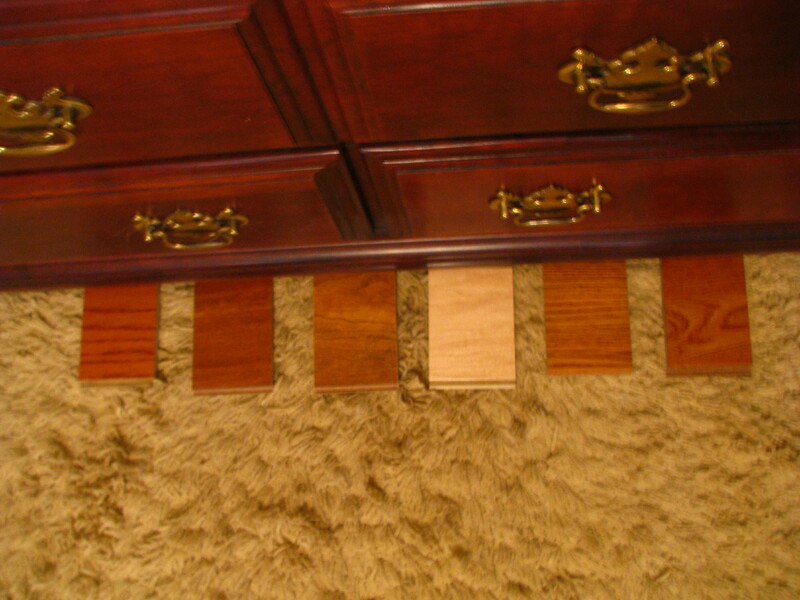 We went yesterday and picked up some samples so we could decided which color we liked best. 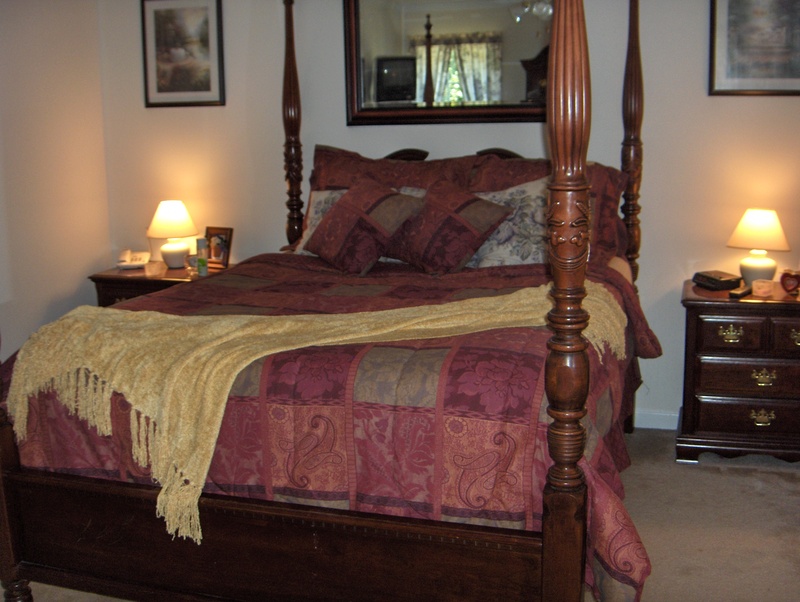 We also have to make the decision as to whether we are only going to put hardwoods in the bedroom and put carpet in the hallway, landing and stairs. Or, do we extend the hardwoods into the hallway, landing and put the stainable wood on the stairs. 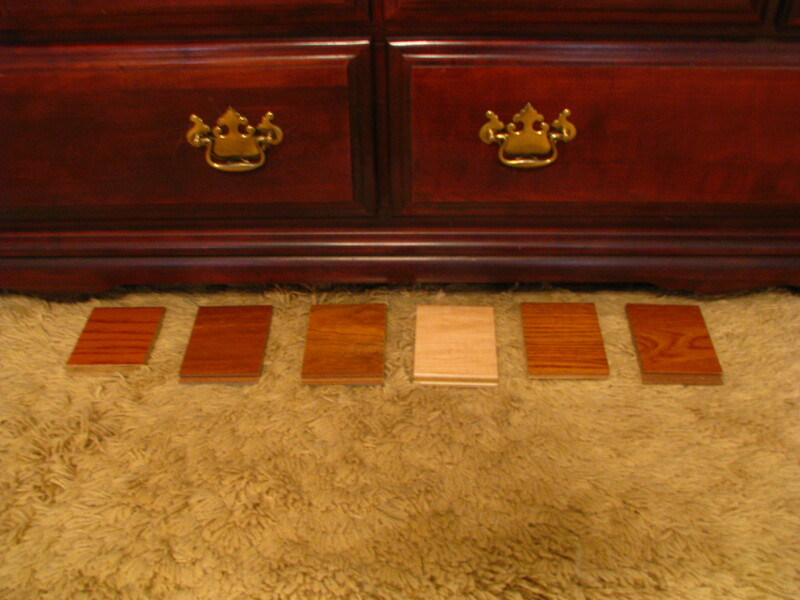 I love the idea of having all hardwoods in the house. Right now, we still have carpet on the stairs and if we remove it and put down the stainable wood, we won’t have carpet anywhere. We are still in the deciding phase on that. 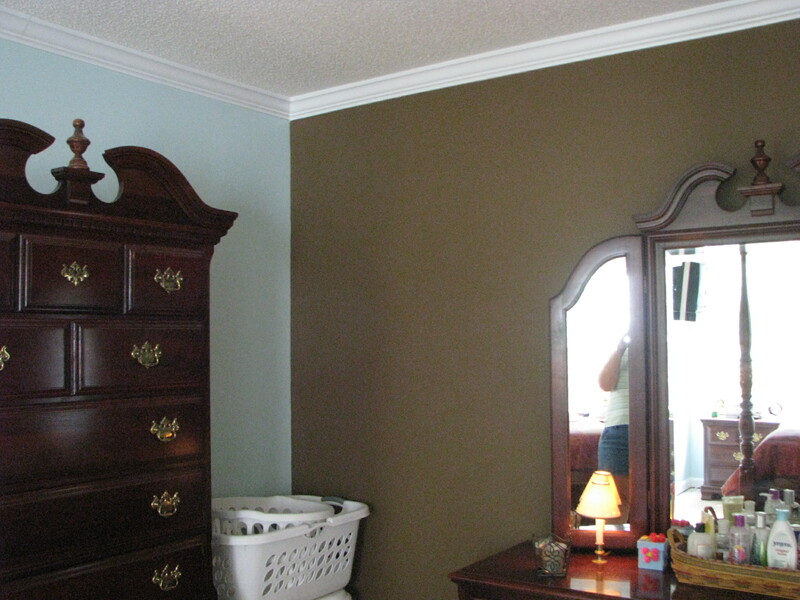 Now, we need to pick out which color to put into the bedroom. This is where I need your help. Here are our choices. Hubby doesn’t like any of them. I don’t know which one I like yet. What do you think? 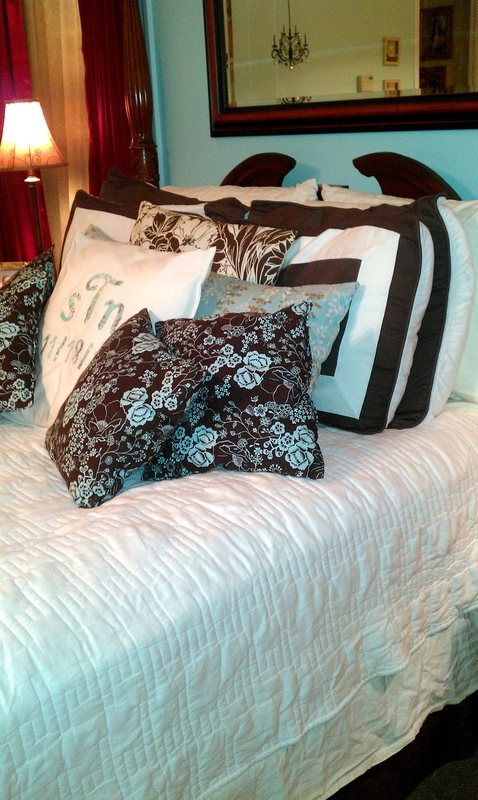 wow your bedroom is looking amazing!! 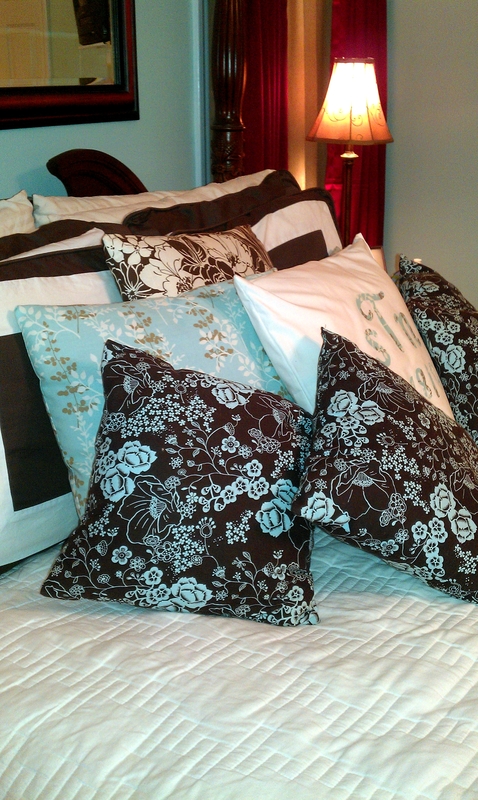 Pretty – that crop of pillows is especially gorgeous!!! 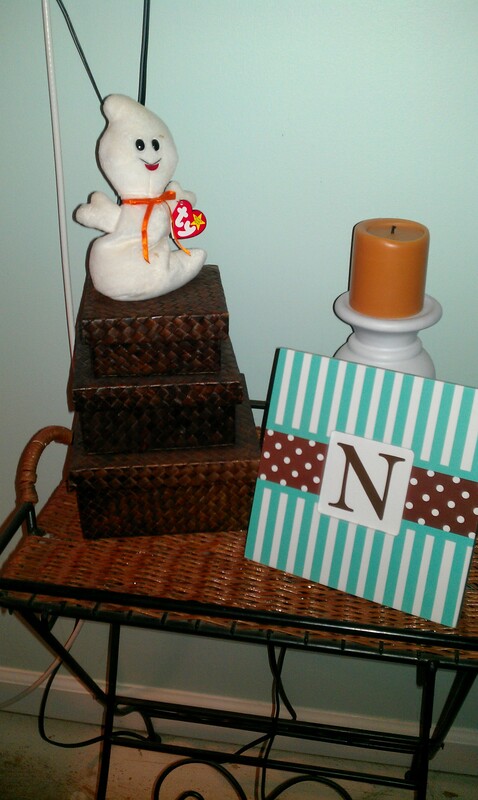 Thanks for linking up on Trash 2 Treasure Tuesday! I feel ya with the ugly carpet! We have a Siberian Husky too that used to sleep under our bed. When we moved it took so many steam cleanings to get the carpet some what decent! Since the move, we no longer allow her in our bedroom but we have also decided to tear out all of the carpet in the house (eventhough its brand new). Nowadays, I feel that carpet is gross and hardwood is so much easier! I love the driftwood grey floors. I would love to incorporate it in our decor someday.